Celebrate your new life together on a Kenya honeymoon safari, where you’ll discover the dramatic Laikipia Plateau and the people, wildlife and endless plains of the Masai Mara. From private dinners and romantic picnics to sleeping under the stars, you’ll be swept away by the romance of this vast, untapped wilderness. Stunning scenery ranging from the Loisaba Private Conservancy with its views across the semi-arid plains and acacia-covered hills of the Laikipia Plateau all the way to Mount Kenya, and Angama Mara, set on the escarpment of the Mara Triangle overlooking the endless, wildlife-rich plains of the Masai Mara. Romantic activities such as sleeping under the stars, private candlelit dinners and picnics and bush sundowners as well as game drives, hot-air ballooning, walking safaris and Maasai cultural experiences. A range of exclusive luxury accommodation, with Loisaba Star Beds offering the chance to sleep under the stars and Loisaba Tented Camp a taste of real tented luxury in the wild, and Angama Mara with its glass-fronted suites perched on the edge of the escarpment. 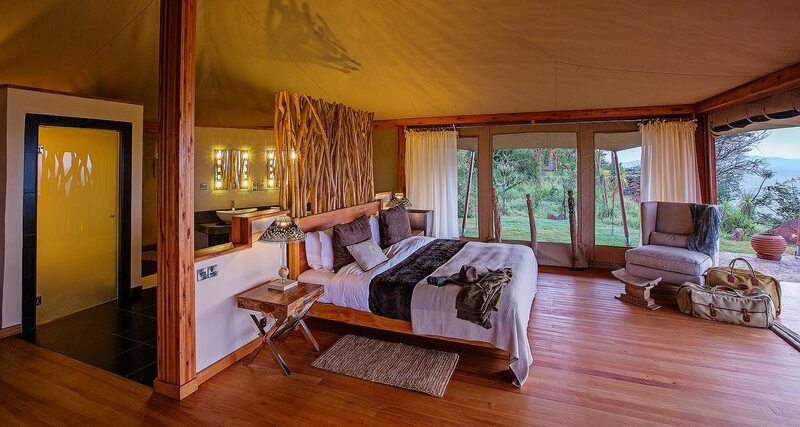 For more information see Loisaba Star Beds, Loisaba Tented Camp and Angama Mara. Loisaba Star Beds – set in a private conservancy on the Laikipia Plateau, northwest of Mount Kenya – was the most beautiful start imaginable for our Kenya honeymoon safari. After a day tracking migrating elephant, we enjoyed bubbly in the bush at sunset. Then followed a romantic candlelit dinner on the deck of our private open-air ‘room’, where a sumptuous four-poster bed had been rolled out from under its thatch roof. As we slipped into its soft embrace, my partner pointed out the Seven Sisters constellation and we cuddled closer into each other, dazzled by the star-crowded African sky above us. Sleeping on star beds was every bit as wonderful as it sounds. 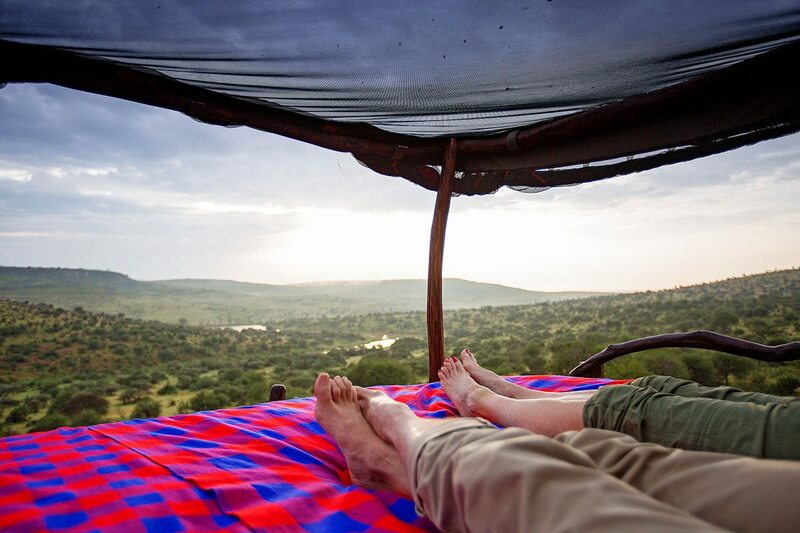 After a short transfer to Loisaba Tented Camp we quickly settled into our spacious tent, which felt like a glamorous palace for just the two of us, with views all the way over the Laikipia Plateau to Mount Kenya. We spent the morning in the sun at the infinity pool, then enjoyed a guided horseriding excursion through the undulating hills of the Loisaba Private Conservancy, where our guide took us right up to a herd of peaceful elephant and pointed out a solitary greater kudu. But the highlight of the day was toasting our marriage with Champagne in the wild, surrounded by the gentle sound of impala grazing around us.A special wake-up tray for two was delivered to our room with a vase of fresh flowers. After a glorious stretch, we left for our early morning game drive, grasping each other’s hands as we watched in a mixture of excitement and dread as African wild dog hunted down an antelope. Later, we stumbled across a pride of lion lazing under the shade of a tree, and took our time watching these kings and queens of Africa in their somnolent majesty. The day ended with an alfresco meal in the open dining room, where we watched stars shoot across the inky sky. After a short transfer to Loisaba Tented Camp we quickly settled into our spacious tent, which felt like a glamorous palace for just the two of us, with views all the way over the Laikipia Plateau to Mount Kenya. We spent the morning in the sun at the infinity pool, then enjoyed a guided horseriding excursion through the undulating hills of the Loisaba Private Conservancy, where our guide took us right up to a herd of peaceful elephant and pointed out a solitary greater kudu. But the highlight of the day was toasting our marriage with Champagne in the wild, surrounded by the gentle sound of impala grazing around us. A special wake-up tray for two was delivered to our room with a vase of fresh flowers. 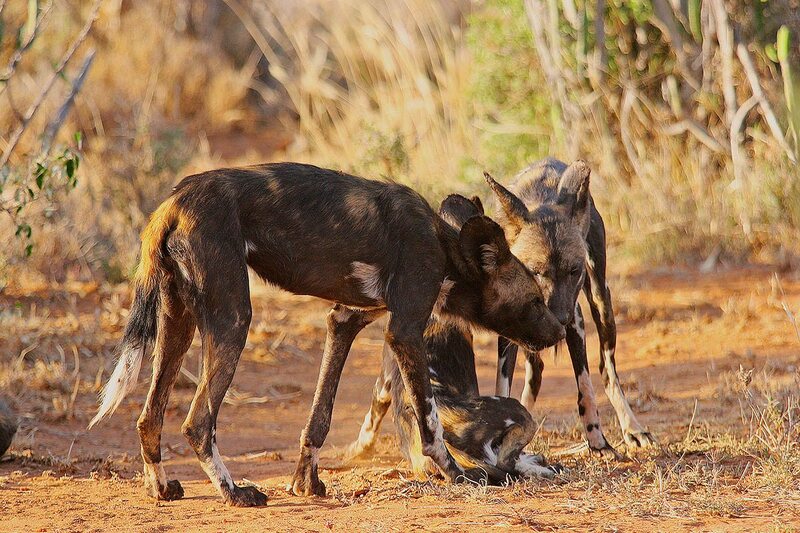 After a glorious stretch, we left for our early morning game drive, grasping each other’s hands as we watched in a mixture of excitement and dread as African wild dog hunted down an antelope. Later, we stumbled across a pride of lion lazing under the shade of a tree, and took our time watching these kings and queens of Africa in their somnolent majesty. The day ended with an alfresco meal in the open dining room, where we watched stars shoot across the inky sky. The first thing we saw from our luxury tented suite at Angama Mara – with floor-to-ceiling glass windows set about 300m above the Great Rift Valley – was sweeping, 180-degree views over the Masai Mara. We couldn’t wait to get a closer look, so we pulled on our walking shoes and set off on foot to explore the pristine wilderness. Our first sighting was of a small herd of impala, which scattered as we approached. Senses on high alert, we followed our Maasai guide through the bush, stopping to identify the plentiful birdlife the escarpment is known for. Almost unconsciously, we clasped each other’s hands, thrilled at the amount of wildlife we saw, including abundant birdlife and smaller creatures.One of Angama Mara’s many claims to fame is its romantic, Out of Africa setting. It was a short walk to the top of the hill the next day, where we enjoyed a lavish picnic exactly where Meryl Streep and Robert Redford posed for the movie poster. The views over the Masai Mara were spectacular, especially when we spotted a journey of giraffe beneath us! That afternoon we discovered the people of the Masai Mara, proud pastoralists who have lived in harmony with the environment for centuries. Later, they danced for us at on the very land that the lodge rents from them. It was a spellbinding performance.After a lazy morning enjoying the comforts of butler service and our suspended suite, we set off for a game drive through the wide, open grasslands of the Masai Mara. We had our own open-top safari vehicle, with a dedicated guide and spotter, who knew exactly where to go for the best sightings. It wasn’t long before we were parked on a hill looking over a sea of migrating wildebeest, Thomson’s gazelle and zebra, feeling the earth shudder as they moved towards the river. We finally understood what it meant to feel their migration as much as you see or hear it.After strong coffee early the next morning, before the break of dawn, we found ourselves dressing in giddy excitement. We couldn’t contain our enthusiasm as we got ready for our hot-air balloon ride, cracking jokes all the way to the launch site. The experience was everything we’d been promised. As we watched the plains turn black with thousands of migrating wildebeest, we relaxed into each other’s arms, thrilled to share this bucket-list moment. 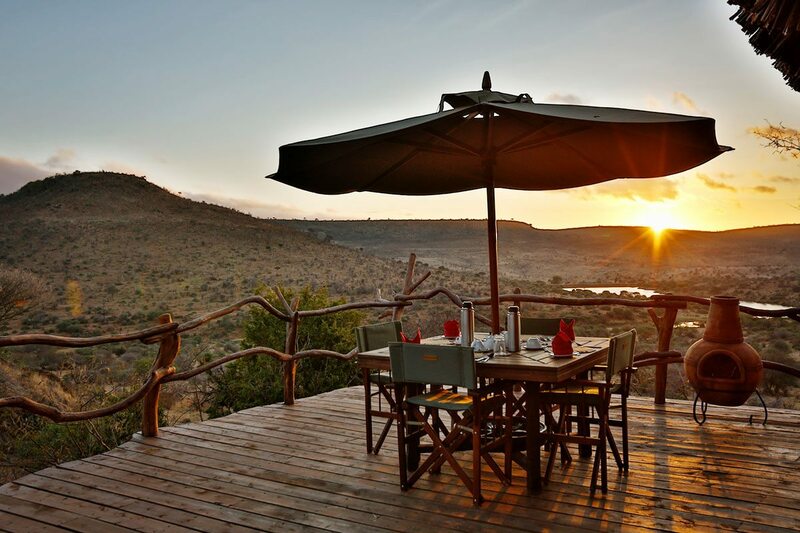 A three-course Champagne breakfast rounded off a truly special morning, with the rest of the day spent at our cliff-top lair.For our final morning at Angama Mara we opted for a leisurely breakfast overlooking the waterhole. We were amazed at amount of birds we identified, although the magnificent lion that came to drink was an even more thrilling send-off for our journey back home. 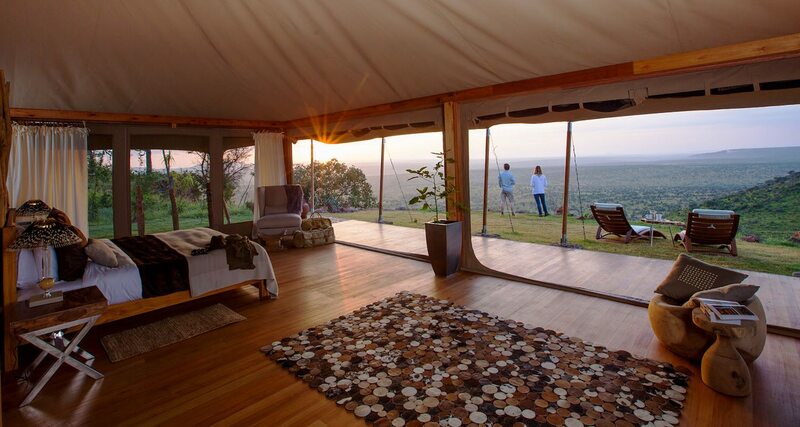 The first thing we saw from our luxury tented suite at Angama Mara – with floor-to-ceiling glass windows set about 300m above the Great Rift Valley – was sweeping, 180-degree views over the Masai Mara. We couldn’t wait to get a closer look, so we pulled on our walking shoes and set off on foot to explore the pristine wilderness. Our first sighting was of a small herd of impala, which scattered as we approached. Senses on high alert, we followed our Maasai guide through the bush, stopping to identify the plentiful birdlife the escarpment is known for. Almost unconsciously, we clasped each other’s hands, thrilled at the amount of wildlife we saw, including abundant birdlife and smaller creatures. 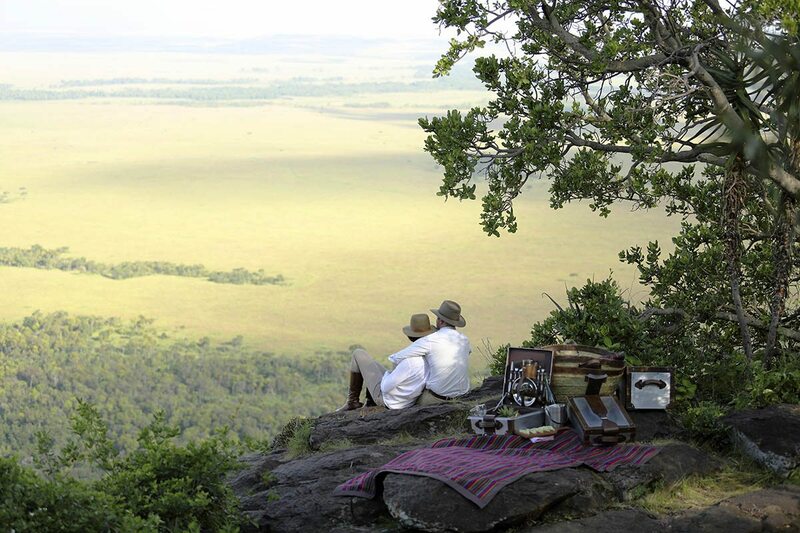 One of Angama Mara’s many claims to fame is its romantic, Out of Africa setting. It was a short walk to the top of the hill the next day, where we enjoyed a lavish picnic exactly where Meryl Streep and Robert Redford posed for the movie poster. The views over the Masai Mara were spectacular, especially when we spotted a journey of giraffe beneath us! That afternoon we discovered the people of the Masai Mara, proud pastoralists who have lived in harmony with the environment for centuries. Later, they danced for us at on the very land that the lodge rents from them. It was a spellbinding performance. After a lazy morning enjoying the comforts of butler service and our suspended suite, we set off for a game drive through the wide, open grasslands of the Masai Mara. We had our own open-top safari vehicle, with a dedicated guide and spotter, who knew exactly where to go for the best sightings. It wasn’t long before we were parked on a hill looking over a sea of migrating wildebeest, Thomson’s gazelle and zebra, feeling the earth shudder as they moved towards the river. We finally understood what it meant to feel their migration as much as you see or hear it. After strong coffee early the next morning, before the break of dawn, we found ourselves dressing in giddy excitement. We couldn’t contain our enthusiasm as we got ready for our hot-air balloon ride, cracking jokes all the way to the launch site. The experience was everything we’d been promised. As we watched the plains turn black with thousands of migrating wildebeest, we relaxed into each other’s arms, thrilled to share this bucket-list moment. A three-course Champagne breakfast rounded off a truly special morning, with the rest of the day spent at our cliff-top lair. For our final morning at Angama Mara we opted for a leisurely breakfast overlooking the waterhole. We were amazed at amount of birds we identified, although the magnificent lion that came to drink was an even more thrilling send-off for our journey back home. 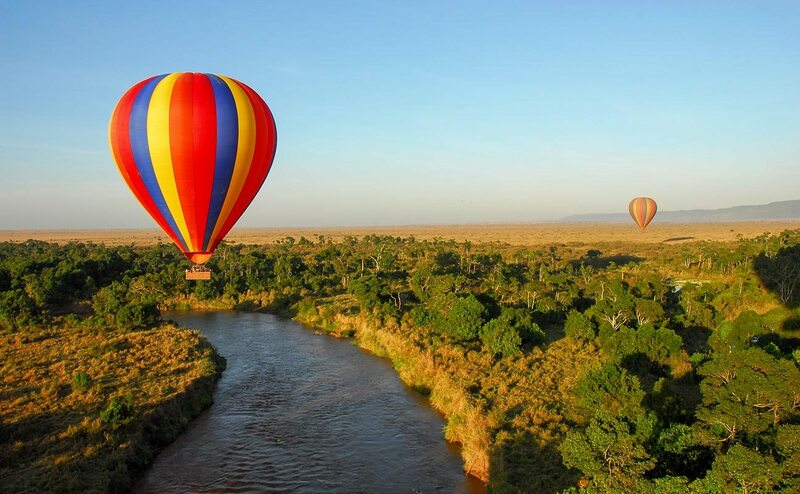 A country steeped in romance, with its vast savannas, brilliant sunsets and star-studded skies, Kenya was an idyllic choice for an unforgettable Kenya honeymoon safari. We spent time discovering the endless horizons of the arid Laikipia Plateau, which stretches all the way to Mount Kenya, before experiencing the open plains of the Masai Mara and the countless herds they attract during one of the greatest wildlife spectacles of the world.We couldn’t have asked for a more romantic time away – cuddling together under the brilliantly-lit night sky at Loisaba Star Beds, sharing bubbly in the savannah after our hot-air balloon ride or while having an Out of Africa picnic … and embracing as we watched thousands of wildebeest stampeding across the plains to the river, with hungry predators in deliberate pursuit.The lodges we stayed at provided incredible flexibility and the type of service that makes everything seem seamless – from finding our bath drawn with steaming hot water after a dusty game drive and rose petals scattered over the bed, to discreet butler service and private candlelit dinners. With plenty of activities to choose from, we could spend our honeymoon being swept away by the excitement of big-game encounters, discovering the beauty in the little things on a walking safari, or simply enjoying the luxurious comfort of our accommodation and the romance of just being together in these stunning locations.We also learned how our lodges work with communities to maintain the ecological balance of these sensitive areas, partnering with local Maasai and Samburu tribes to safeguard the habitat of Kenya’s plentiful wildlife.Our honeymoon was everything we imagined, and more – the perfect blend of intimacy, romance and adventure in celebration of a lifetime to spend together. A country steeped in romance, with its vast savannas, brilliant sunsets and star-studded skies, Kenya was an idyllic choice for an unforgettable Kenya honeymoon safari. We spent time discovering the endless horizons of the arid Laikipia Plateau, which stretches all the way to Mount Kenya, before experiencing the open plains of the Masai Mara and the countless herds they attract during one of the greatest wildlife spectacles of the world. We couldn’t have asked for a more romantic time away – cuddling together under the brilliantly-lit night sky at Loisaba Star Beds, sharing bubbly in the savannah after our hot-air balloon ride or while having an Out of Africa picnic … and embracing as we watched thousands of wildebeest stampeding across the plains to the river, with hungry predators in deliberate pursuit. The lodges we stayed at provided incredible flexibility and the type of service that makes everything seem seamless – from finding our bath drawn with steaming hot water after a dusty game drive and rose petals scattered over the bed, to discreet butler service and private candlelit dinners. 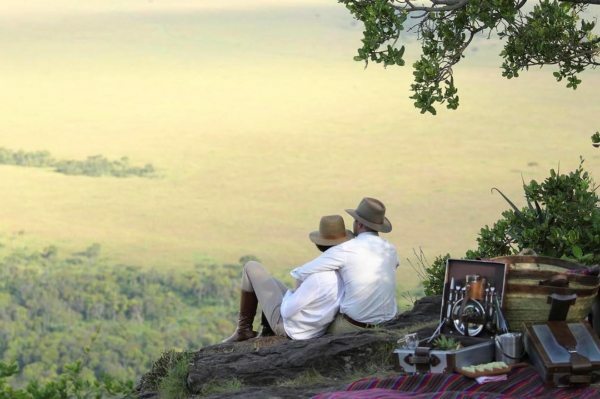 With plenty of activities to choose from, we could spend our honeymoon being swept away by the excitement of big-game encounters, discovering the beauty in the little things on a walking safari, or simply enjoying the luxurious comfort of our accommodation and the romance of just being together in these stunning locations. 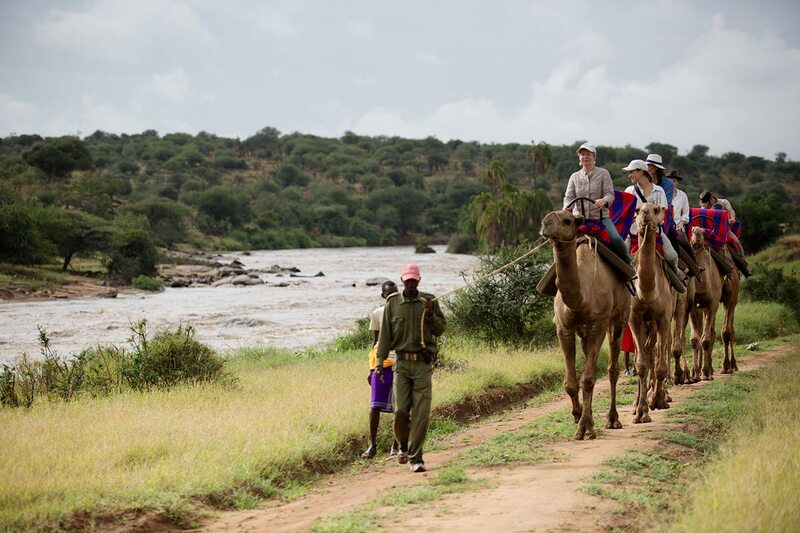 We also learned how our lodges work with communities to maintain the ecological balance of these sensitive areas, partnering with local Maasai and Samburu tribes to safeguard the habitat of Kenya’s plentiful wildlife. Our honeymoon was everything we imagined, and more – the perfect blend of intimacy, romance and adventure in celebration of a lifetime to spend together. 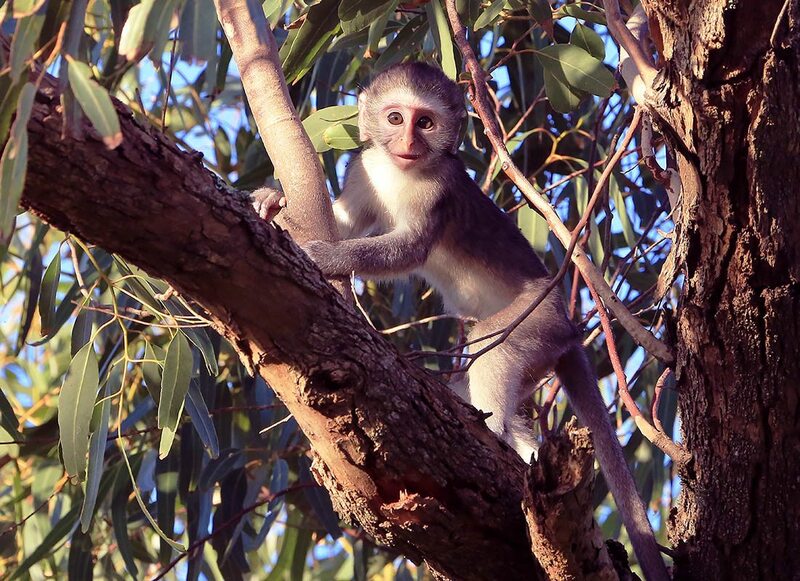 You might see vervet monkey in northern Kenya, like this playful youngster. 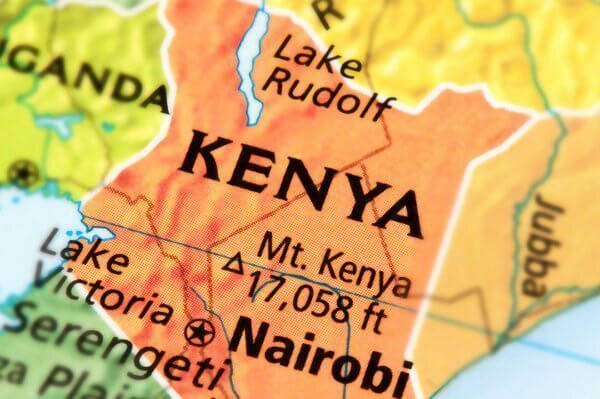 You’ll be met as you disembark from your international flight at Jomo Kenyatta International Airport in Nairobi, and assisted through customs and immigration. After a transfer to Wilson Airport, you’ll take a scheduled light-aircraft flight to Loisaba, and a transfer to Loisaba Star Beds, where you’ll spend one night. 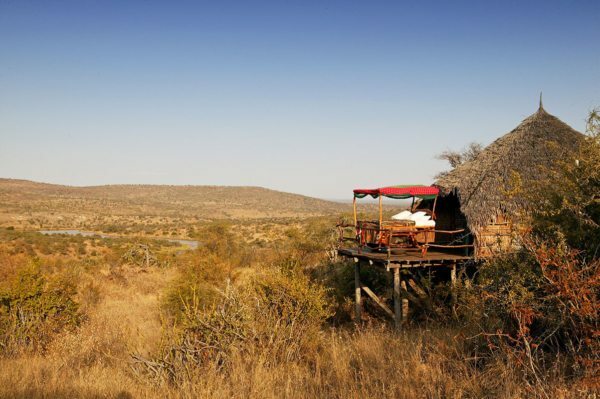 A transfer will take you from Loisaba Star Beds to Loisaba Tented Camp, where you’ll spend two nights. After a transfer from Loisaba Tented Camp to the airstrip, you’ll take a scheduled light-aircraft flight to Nairobi, and another to the Masai Mara. 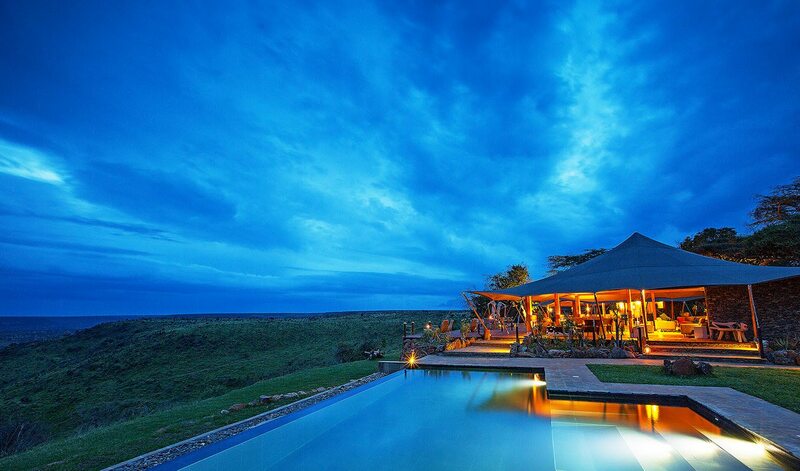 A transfer will then take you to Angama Mara, where you’ll spend four nights. After a transfer from Angama Mara to the airfield, you’ll take a scheduled light-aircraft flight to Nairobi. A transfer will then take you to Jomo Kenyatta International Airport, to connect with your international flight. We also offer a curated selection of Kenya safari packages, wrapped and priced for your convenience, click here to explore them. This multi-generational safari combines the best of Kenya’s savannah and seaside. With time in the Masai Mara and on the Kenya South Coast, it really does have something for everyone, whether young or young at heart. Exclusive-use villas give each generation ample space, while really letting them bond. Luxury is in the heart of the beholder, and a luxury Kenya safari is about more than sinking into soft cushions. It’s a chance to immerse yourself in landscapes, conservation initiatives and the lives of local people. Living in the moment makes more much sense when each one is breathtaking. Enjoy two unique family villas in Kenya’s remote, wild and arid north, where flexible schedules, specially-prepared meals and private guides all come standard. 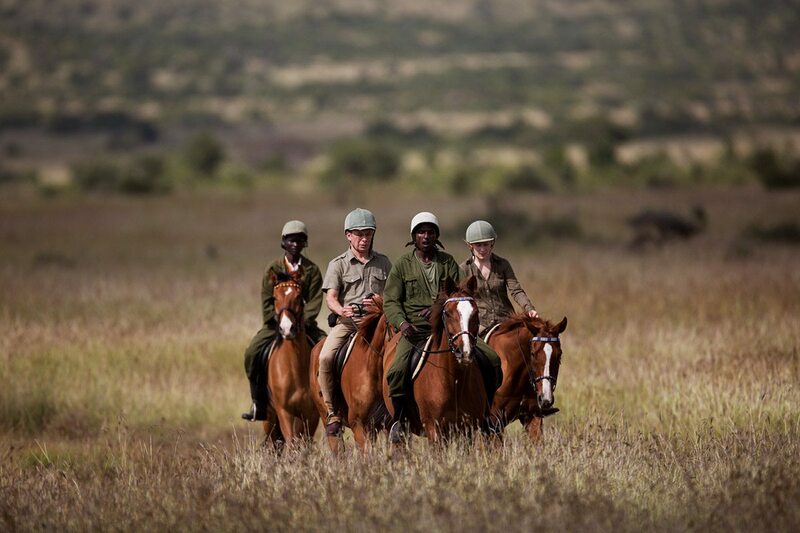 Discover Kenya’s wildlife with warrior training, game drives and camel trekking, or stay in and unwind, knowing the kids will be having the time of their lives. This nine-night stay in three luxury Kenya safari lodges lets you really appreciate the landscapes, people and wildlife that make this country special. Be introduced to the elephant, the warriors and the leading conservationists who are preserving – and transforming – the Masai Mara and northern Kenya. 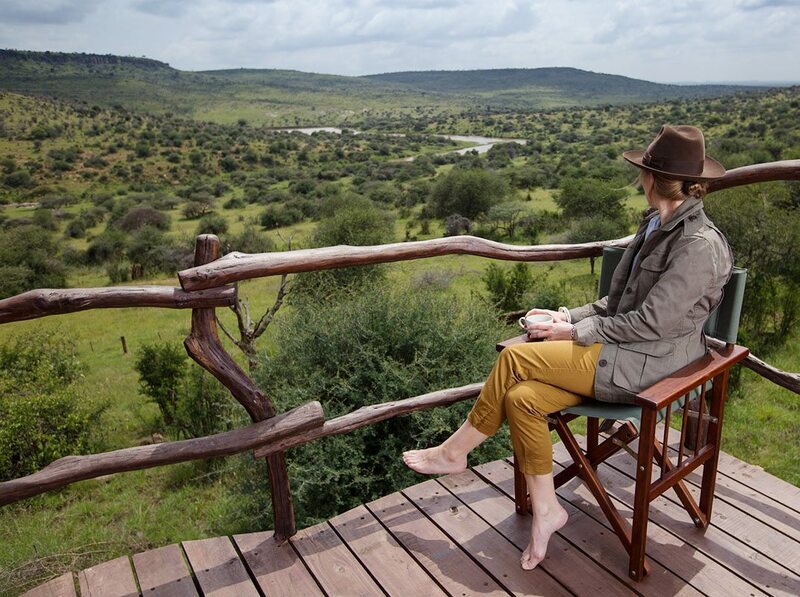 Relax with a slow safari at Chyulu Hills’ ol Donyo Lodge, horseriding or kicking back in a wildlife hide, before picking up the pace with abundant game sightings in the Masai Mara, staying at the exclusive Mara Plains and Angama Mara camps. 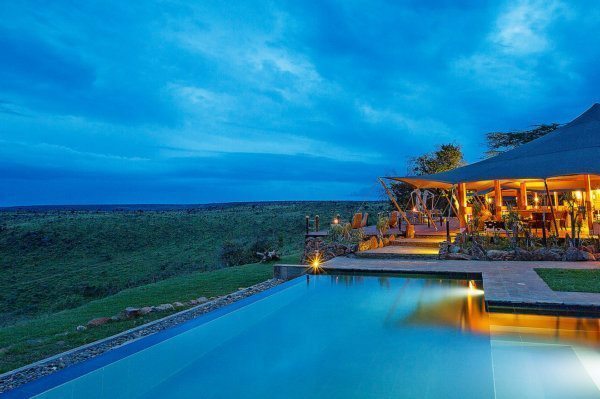 This eight-night luxury Kenya safari has it all. Explore the more arid Laikipia before heading to the lush plains of the Masai Mara with this comprehensive seven-night itinerary. Your luxury Kenya safari includes a private cottage, a star bed and two modern tented camps, each with their own exciting safari activities, from horse riding to hot-air ballooning. Experience both the Samburu and the Masai Mara regions on this luxury Kenya safari. Stay in two luxury camps, where you’ll enjoy game drives, hot-air ballooning, walking safaris, quad biking and more, giving you endless opportunities to witness the Great Wildebeest Migration, or spot the Samburu Special Five. 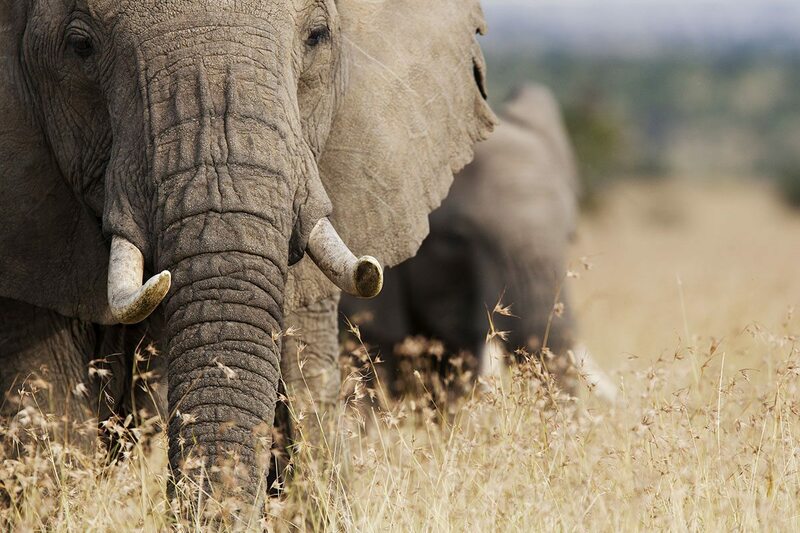 Experience Kenyan hospitality and wildlife encounters on a six-night luxury Kenya safari. 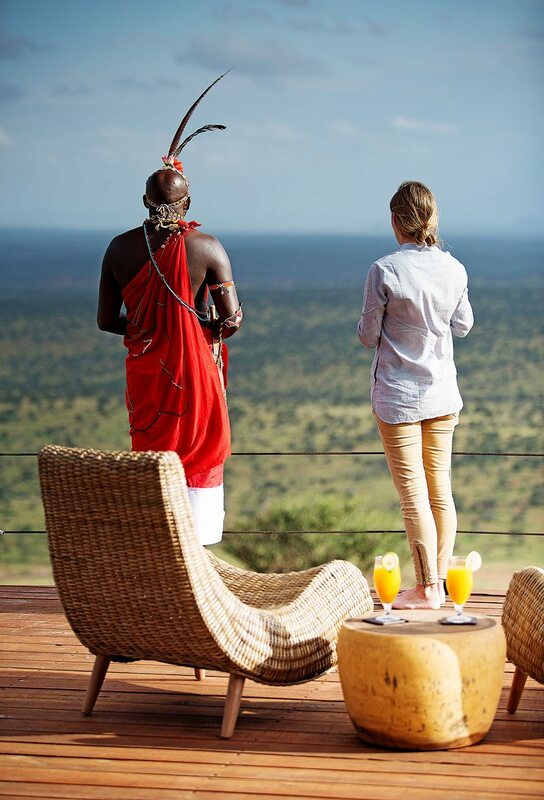 With your stay divided between Sirikoi and Cottar’s 1920s Camp, you’ll get to see the unique landscapes of both the ground-breaking Lewa Conservancy in Laikipia and the game-rich plains of the iconic Masai Mara National Reserve.